Tags are public, which means that everybody can see them in the online catalog. The creator of a tag does not control its use in the catalog. Others may add the same tag to other records. Take a look at the his8204 tag. Anybody can add the his8204 tag to a similar or a totally unrelated title. Records with the same tag can be retrieved with a tag search, one of the search options in the catalog. Simply type h into the search box. The new search prediction feature of the online catalog will list all existing tags with an initial h, among them his8204. Tags are a social bookmarking feature and are generally used for classification purposes. Each tag represents a piece of metadata contributed by the community. I used the his8204 tag to create a list of selected ancient sources in translation. Tags are great for students collaborating on a project. Just remember that you have no editorial control over the use of a tag. This also means that the community can contribute to your list and expand it. It is easy to create new lists and add tags in the online catalog. Give it a try. 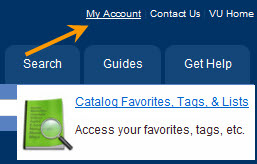 To access existing lists in your personal catalog account, simply click on My Account in the top right hand corner of the library’s Web site and log into Catalog Favorites, Tags & Lists. Feel free to contact us with any questions or comments that you may have.